Tara bought her Ford F150 from Leif Johnson five months ago, and couldn’t be more pleased with her purchase. Before coming to Leif, she visited another dealership and remembers that “They didn’t seem interested in talking to me.” This definitely was quite different than the “awesome experience” she had with us over at Leif Johnson. 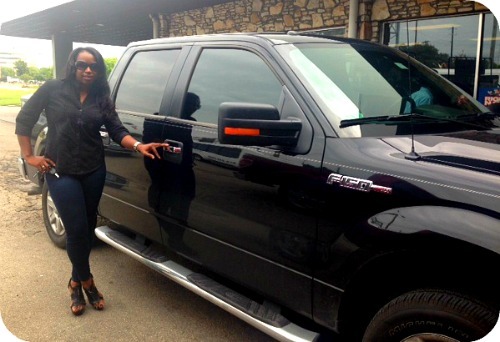 Tara recounts her salesman walking right up and introducing himself, and from there immediately taking a test drive in the F150 that would later become her prized new truck. She also tells us that the whole process was “very easy” and while the customer service was both “friendly and respectful”, she never once felt as if she was being hassled to buy a vehicle. She also loved the fact that the Leif Johnson crew took the time to check up on her and her new truck. We couldn’t be more excited that Tara was able to bring home her dream truck and would love to help you do the same! Donating to your🥕 local food bank🥕 is a great way to make an impact in your community. We want to provide recognition to our employee, Elleana. She began with placing an empty box with a letter that read surprising statics on how many individuals in the local Austin counties that do not meet their food needs. These numbers motivated Elleana to spread awareness and because of her, Leif Johnson was able to collect 100 cans (double her goal) from employees and customers to the @ctxfoodbank. Coming together to help one another is always in season. Check out the local Food Banks in your area and see how you can create a difference for someone in your community today.